I love cooking. There's something satisfying about making a meal and occasionally even serving it to others. But while I'll spend hours on end completing a quest line or tackling a new boss, I can't always find the inspiration to cook. In fact, I've been known to occasionally skip a meal in real-life to level up my cooking skill in a game. So, I reasoned, why not combine my love of cooking with my other great love, gaming, and try my hand at some real-world versions of videogame food? It would be an interesting quest with tangible rewards and force me to branch out into some different ways to refill my mana and health. While it would have been easy to pick a single game and cook five different recipes, I set out with two goals for myself: first, to cover five different games, and second, to hit most of the main components of a meal - a drink, appetizer, side dish and dessert. Fortunately, I found a way to do both. 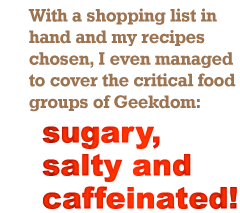 With a shopping list in hand and my recipes chosen, I even managed to cover the critical food groups of Geekdom: sugary, salty and caffeinated! The most popular flavored soft drink both prior to and after the Great War, this radioactive concoction is a staple of the Fallout universe. According to lore, Nuka-Cola contains the essence of at least 17 different fruits alongside the typical cola ingredients. The "Quantum" version I found at Instructables, however, is considerably simpler: Most of the ingredients were available at the local grocery store, except for the Foosh mints, which were a special-order item and took an extra couple days to get here. Obviously there aren't any real fruits involved in making Nuka-Cola, nor do you need any kind of equipment to carbonate the concoction yourself. Instead, the recipe I found only requires three different kinds of soda, a mixing cup and an exceptionally caffeinated mint. In Fallout, you find bottles of Nuka-Cola strewn all over the place, and drinking one has a slight health benefit. In the real world, you not only have to mix your own, but you will also probably lose some health by drinking it. When I finished mixing my version of the cola, I took a sip. It was painfully sweet and tasted everything like citrus and nothing like actual cola. After one small glass, I decided I'd had enough. Later on that evening, I attempted to give it another try and found it didn't keep well. By the next morning, the soda had turned approximately 98 percent mint, two percent citrus and 100 percent undrinkable. That said, I still cheerfully labeled it "better than expected" - after all, I didn't end up glowing green.